Preschool rhyming and cutting activities are combined with a bit of creativity. Practicing cutting skills in conjunction with rhyming skills is a rare combination in most curriculum idea books or websites. A savvy teacher, however, can easily combine these skills by thinking outside the parameters of a typical rhyming lesson. The following three rhyming and cutting activities can be used word for word with preschoolers, or they can be reformed to suit each individual preschool classroom. Cut out a large cardboard or paper fish bowl. The bowl should be large enough for a rhyme to be placed in the center and room for child created fish around the rhyme. Create a copy of the rhyme pictured to the right. Outline a simple fish shape on different colors of construction paper then ask children to cut out their fish. Review the rhyme on the fishbowl with the children and invite the children to glue or tape their fish to the fishbowl. A variation of this project involves leaving the last word off the end of each line of poetry. Outline the missing words on the fish, then ask the children to trace the word before cutting out the fish. Children can add fish to the lines of poetry by filling in the word on their fish to match its correct place in the rhyme. Distribute magazines to children such as toy store flyers or toy magazines. Give children scissors then allow them to find pictures of rhyming objects to cut out of the magazine. Children may find pictures of bikes which rhyme with pictures of toy microphones, or mics. Doll cribs rhyme with doll bibs, and so on. Ask the children to name the pictures then attach the rhymes to individual collages. Prepare words or pictures on paper and draw a circle or square around the word. Ask the children to cut out the shapes with the words. Use the cut outs to make a hat by attaching a strip of paper, approximately twenty-four inches in length, to each end of the shape. Place the hat on the head after reviewing the word or picture with the student. Allow the students to find others who have words or pictures which rhyme with their own words. Ask the new partners to sit together, then create a verbal sentence together using their two rhyming words. 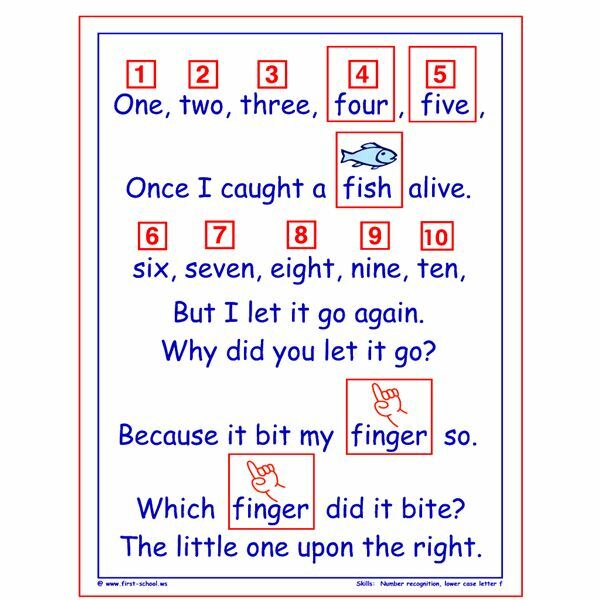 Teaching cutting encourages fine motor skills and strengthens hand muscles necessary for future writing and printing skills, while rhyming integrates literacy into lessons. Preschool rhyming and cutting activities, while seemingly separate activities, can be lessons taught together by a creative preschool teacher. The three listed lessons are the beginning of combining cutting with rhyming in a preschool curriculum.